Professor Wahba holds a PhD in Mechanical Engineering from Aachen University, Germany, a Master of Science in Systems and Biomedical Engineering and a Bachelor of Science from Cairo University, Egypt. 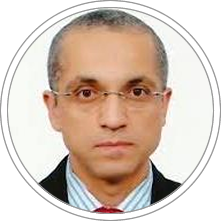 Professor Wahba is an Assistant Professor at Cairo University, a CEO at Taya IT, and an Executive Director at RITI. He has also been an Academic Advisor at RITI, and an Adjunct Assistant Professor at University of Louisville, United States. Aboamer, M., Azar, A. T., Wahba, K., & Mohamed, A. (2014). Linear model-based estimation of blood pressure and cardiac output for normal and paranoid cases. Neural Computing and Applications, 25(6), 1223-1240. Aboamer, M., Azar, A. T., Mohamed, A., Bär, K.-J., Berger, S., & Wahba, K. (2014). Nonlinear features of heart rate variability in paranoid schizophrenic. Neural Computing and Applications, 25(6), 1223-1240. Hashem, A. M., Rasmy, M. Emad M., Wahba, K., & Shaker, O. G. (2012). Single stage and multistage classification models for the prediction of liver fibrosis degree in patients with chronic hepatitis C infection. Computer Methods and Programs in Biomedicine, 105(3), 194-209. Azar, A. T., & Wahba, K. (2011). Artificial neural network for prediction of equilibrated dialysis dose without intradialytic sample. Saudi Journal of Kidney Diseases and Transplantation, 22(4), 705-711. Azar, A. T., Kandil, A., & Wahba, K. (2010). Effect of slowing blood flow technique on post-dialysis urea rebound and equilibrated dialysis dose. Journal of Engineering and Applied Science, 57(4), 297-311. Hamlin, R. G., Nassar, M., & Wahba, K. (2010). Behavioural criteria of managerial and leadership effectiveness within Egyptian and British public sector hospitals: an empirical case study and multi-case/cross-nation comparative analysis. Human Resource Development International, 13(1), 45-64. He currently is a Professor and Researcher at the Strategy and Leadership department at CENTRUM Católica Graduate Business School.